Welcome here again! I’m glad you are getting informed by reading our various educative posts; otherwise, you won’t come visiting again. Anyway, it’s good to have you here. 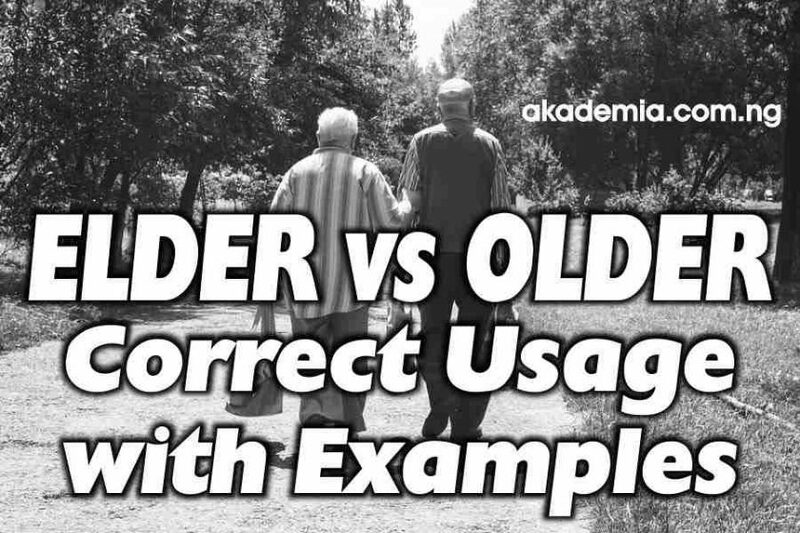 I present to you Elder vs Older: Correct Usage with Examples. You would not believe that many people use these two words interchangeably; however, you cannot use the two words as such. This is an adjective that conveys the idea or that refers to someone born earlier or born before another, especially within a family. It also connotes the idea of one who has more seniority. In another vein, ‘elder’ can mean ‘superior to others, either by rank or by experience’. She is the elder of Ruth’s daughters. Mark is my eldest son. The smaller boy is the elder of the two. His elder brother arrived before him. Her elder sister lives in America. She has an elder sister. She is the elder of the two. Was the eldest son at the ceremony? I am the eldest in the family. Who needs attention in the community more than the elderly? The teller prefers to attend to the elderly first. Professor Jeff is regarded as one of the elderly academic. The church looks ancient but the castle is the older of the buildings. Older generations knew nothing about the digital revolution. The smaller girl is the older of the two. It was the older children who helped him. I am older than John. She is the older of the two siblings. The singer is the older of the two. It is the oldest church in England. He is the oldest serving president. The girl looks older than her age. She is five years my elder. Important issues used to be decided by the village elders. Children should respect their elders and betters. The pastor ordained new elders in the Church. My father is a community elder. Such ceremonies are held in the compounds of the elders. You can use both depending on the context of usage or utterance. However, we have established that we can use elder only in relation to people and mostly in the context of family relationships while we can use older in reference to things as well as people. Many people believe they can be used interchangeably but from the foregoing, it appears elder brother is more appropriate than older brother. You cannot be “elder” than someone, but you can be “older” than them and you become the elder brother or sister of that person you are older than. However, you can have an older generation, older technology, older methods, older person, etc. In another vein, you can say: He has an older brother and by extension, He is the older of the two. On the contrary, to say He is older than Harry might not be incorrect. Many words in English that have similarities in the way they look or sound (See Homophones, Homonyms and Homographs) are wrongly used; and this post takes a look at two of such words, elder and older. I’m sure you have learnt one or two things and you would not want to keep the knowledge to yourself. In that case, do not forget to share this post with someone you care about. Sharing is just a button and a click away! You can also check some other educative posts on this platform particularly commonly confused words in English and commonly used wrong Words in English.